Preheat oven to 350 degrees. 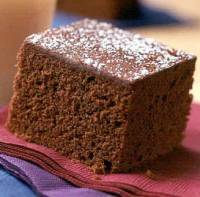 Mix flour, brown sugar, cocoa, baking soda, and salt in an ungreased square pan 8 x 8 x 2 inches. Stir in remaining ingredients except for the chocolate chips. Sprinkle chocolate chips over batter. Bake 35 to 40 minutes or until wooden toothpick inserted in center comes out clean. Cool on wire rack. Sprinkle with powdered sugar if desired. Makes 9 servings. *If you are baking with an even larger gang of kids, this recipe can be doubled and baked in a 13 x 9 inch pan. *If you want to be an even bigger hero, serve this cake warm from the oven with ice cream.